Prabhas got a huge fan following & very good response from movie lovers all over India after his latest release Baahubali. Currently he is meeting all national political and celebrities. Prabhas recently met PM Modi and other cabinet ministers along with his uncle Krishnam Raju. But, yesterday was quite thrilling for Baahubali star! He found that Ajay Devgan is staying in the same hotel as Prabhas and his family was. 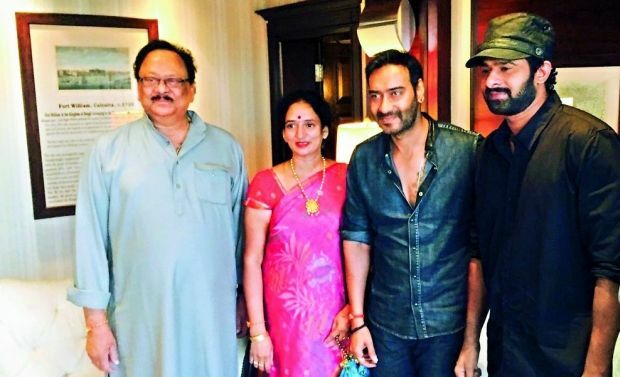 Prabhas is a fan of Bollywood Singham so, he decided to take some time out to meet Ajay Devgan. Sources close to Ajay revealed that both of them discussed a lot about the movies & in even Prabhas introduced his family to Ajay Devgan. Both of stars clicked pics with each other. Ajay Devgan has watched Baahubali & loved it, also Prabhas promised Ajay that he will surely watch his movie Drishyam.